A one-of-a-kind bottle of 60-year-old Macallan single malt could become the world’s first £1m whisky when it is auctioned by Christie’s in London next month. 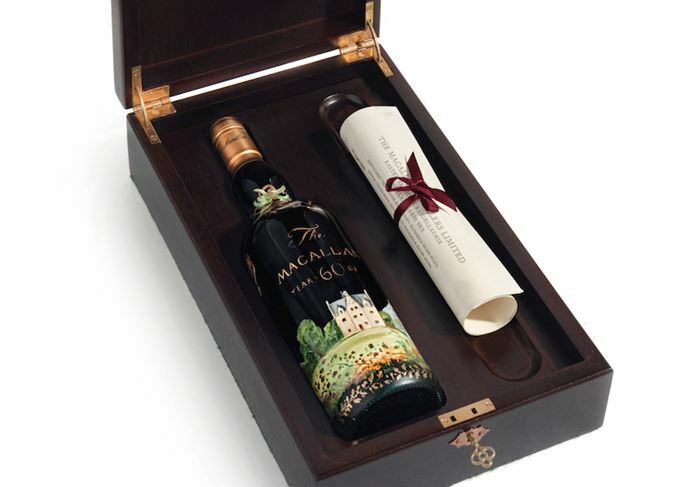 The bottle of Macallan 1926 60-year-old features a depiction of the distillery’s spiritual home, Easter Elchies House, hand-painted by Irish artist Michael Dillon and first offered for sale by Fortnum & Mason in London in 1999. Christie’s pre-sale estimate places the value of the bottle ‘in the region of £1m (US$1.3m)’. ‘The Macallan were unsure that this bottle still existed – it was last seen at Fortnum & Mason in London in 1999 – and it is quite excited that the buyer has kept hold of it,’ said Tim Triptree MW, Christie’s international director of wine. The bottle is drawn from the same cask – number 263, filled in 1926 – that yielded the two sets of 12 bottles with labels designed by famed pop artists Sir Peter Blake and Valerio Adami. These bottles have been setting world records throughout 2018, first with the sale of a pair by Dubai Airport retailer Le Clos in April, and then with the Bonhams auctions of two more bottles in Hong Kong in May. The most recent record-breaker emerged only yesterday (3 October), when Bonhams auctioned an Adami bottle for £848,750 (US$1.1m) in Edinburgh. Meanwhile, Sotheby’s is poised to auction another Sir Peter Blake Macallan in New York next week, with the single bottle expected to fetch US$700,000-1.2m. The Michael Dillon Macallan bottle will be auctioned by Christie’s in London on 28-29 November this year, part of the largest offering of spirits yet offered by the auction house in London. The sale also includes a bottle of Macallan Lalique 50-Year-Old (estimate: £60,000-80,000), one of only 470 bottles released in 2005 and the first filled into a specially created Lalique bottle. There is also a Yamazaki 50-Year-Old 1st Edition (est: £150,000-200,000), one of only 50 bottles released in 2005; a 1919 vintage Springbank (est: £100,000-150,000), one of only 24 bottles filled at the Campbeltown distillery in 1970 and released in 1989; and a 1902 Highland Park Reserve (est: £4,000-5,000) bottled by Berry Bros & Rudd in the 1950s. The two 60-year-old single malts fetched more than US$1m each at auction in Hong Kong. The bottle, hand-painted by Irish artist Michael Dillon, fetched £1.2m at auction in London.